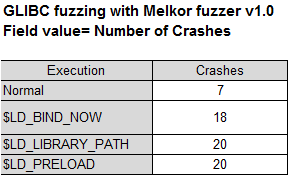 A few years ago I released an ELF file format fuzzer, Melkor, and recently just came up with the idea to fuzz the parsers in binutils’ BFD library, through ld at the linking phase, and the parsers and loader(s) in GLIBC to see if there could be something interesting. Before running we need to walk; that said, we need to see the different scenarios where ELF files take places when building an executable. As explained in , when you type gcc foo.c -o foo, gcc only performs the preprocessing and compilation, and later on it acts a wrapper that launches the programs in charge of the subsequent phases: assembly and linking, achieved by the GNU assembler (as) and the GNU linker (ld) respectively, and both part of GNU binutils. In the end, at the linking phase, ELF files, particularly object files (.o) and shared objects (.so) (the blue rectangle in the following picture) are linked altogether to create the final outcome: an ELF executable. At runtime: those executable files that were successfully created with malformed ELF objects and dynamic objects, will be executed to see how GLIBC’s runtime linker (aka dynamic linker or dynamic loader) parses and loads it in memory prior its execution. Binutils was compiled and installed through the usual configure, make, make install. The following CFLAGS were used for debugging. 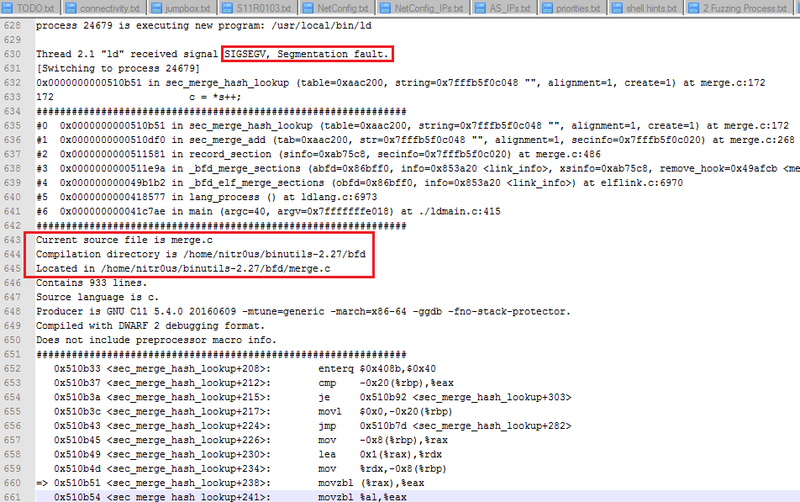 Reading symbols from /lib/x86_64-linux-gnu/libc-2.23.so...Reading symbols from /usr/lib/debug//lib/x86_64-linux-gnu/libc-2.23.so...done. Line 28 of "stack_chk_fail.c" starts at address 0x118500 <__stack_chk_fail> and ends at 0x118507 <__stack_chk_fail>. Once the corrupted files were created, it’s time to link them through ld to finally test the parsers in BFD. To do it in an automated fashion, a small bash script was used. Also provided at the link at the beginning of the article. The results/ folder is also supplied in the .tgz. If ld didn’t crash when creating the executables, then, we proceed to execute them. 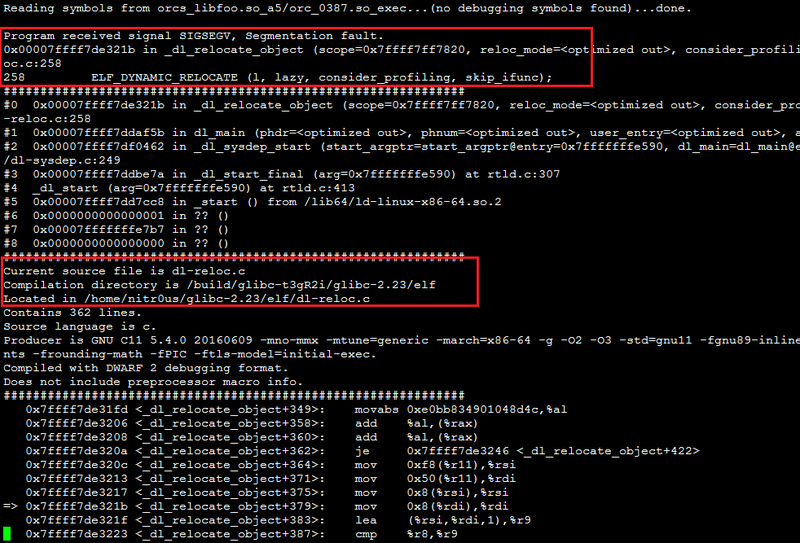 Three more execution runs were done with the LD_BIND_NOW, LD_LIBRARY_PATH and LD_PRELOAD fuzzed too. 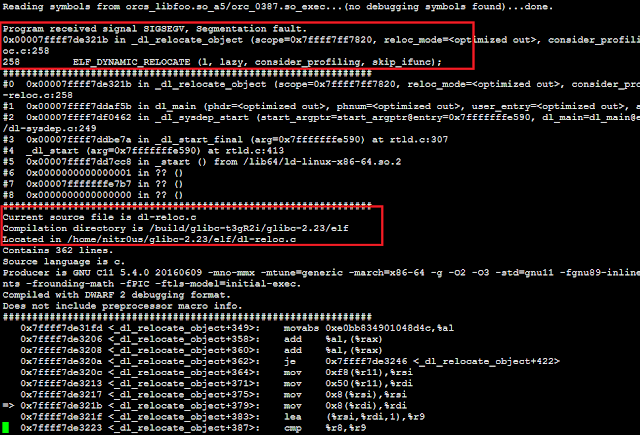 Finally, details of the crashes inside gdb.txt. The same procedure describe above was used. I guess the most interesting SIGSEGVs are the ones corresponding to the Dynamic Linker (/home/nitr0us/glibc-2.23/elf/dl-*.c). I had time only to perform the fuzzing process and to dump basic info with gdb with basic shell scripting, as shown above. However, haven’t had time to go through the source code and see what’s going on in detail and to see if there are some crashes that might have impact in security (i.e. memory corruption vulnerabilities, off-by-one, integer overflows, etc. etc.). Therefore, if you have some spare time in your agenda, I encourage you to analyze the source code to find – and fix if possible – the root causes of these crashes. How to Compile and Run C Program in Linux Using gcc?